Our time is not our own. As believers, every breath belongs to God. When we confessed Jesus Christ as Lord of our lives and received salvation, He became Lord of our time as well. As disciples of Jesus Christ, we must be good stewards of our time. We have 24 hours, 1440 minutes and 86,400 seconds in every day. What are we doing with them? Is our time wasting away? Are we careful or frivolous with our time…letting it slip through our hands like sand in an hourglass? Time is a precious commodity…once lost it is gone forever. Time is unique in that it cannot be accumulated like money or stockpiled like some other resources. In addition, we are forced to use time whether we choose to or not…but once used it is irretrievable. So the question becomes, “Am I using God’s gift of time wisely and purposefully?” Regrettably God often gets our leftover minutes after we have exhausted our hearts and minds and energy on everything else? We have become masters at wasting our time. We live in the age of distraction with IPads, IPhones, Xboxes, TV, video games, the internet and so much more…things that can detract from our relationship with God and our growth as a Christian. It has been said that the average American watches 4 hours of TV each day (or 28 hours/week, or 2 months of TV-watching per year). Oh by the way, Satan is the prince of the power of the air so who do you think is feeding our hearts and minds during those four hours we are watching TV? It is precious…for the richest woman in the world cannot purchase a single second. It cannot be recovered once it is past. 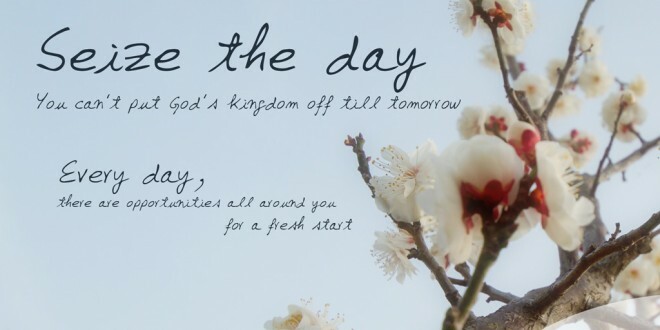 In reality our calendar should have only two days…today and that day (the day we will be with the Lord). If we remind ourselves every day of the purpose of our time on earth we will cultivate an eternal perspective on time – one that will influence our work and all our relationships. It has been said that life is not measured by the breaths we take, but by the moments that take our breath away…the times we know that what has happened in us, around us or through us was orchestrated by our loving God. So how do we redeem the time? Perhaps we can start by asking some questions. Am I present in the moment? Do I do one thing at a time, giving whatever is at hand my undivided attention? We only get one chance to spend the present moment – let us invest it in something of eternal worth. What am I doing that really doesn’t need doing? Eliminate the unnecessary. What am I doing that could be done just as well by someone else? Learn to delegate. What am I doing that wastes my time or others’ time? Have I observed that often what I put off I end up not doing anyway? Am I biting off more than I can chew, time-wise? Am I trying to cram too much into one day? Remember the importance of prioritizing. Break down big or hard tasks into smaller, manageable tasks. Am I setting deadlines for what I want to do? Or, am I drifting through life with no plans, no schedules, and no organization? How we use our time reveals a lot about our character. It shows where our heart is (Matthew 6:21). Matters that are important to us and of eternal value will receive proper attention only if we first learn to use our time wisely. We have no other time in which to live. We shall never have any time but time present. So, what will you do with your next 24 hours? Redeem the time! What are you waiting for? Truth to Claim: Our time is not our own…it belongs to God. Application: Consider the questions above and ask God to reveal to you how you can redeem time in your life.